If gum recession is affecting your health or your appearance, a procedure called gingival (gum) grafting may be recommended. Although it might sound scary, a variety of gum grafting procedures are routinely performed by periodontists (specialists in the area of gingival tissue), and by some general dentists with specialized training in this field. Gum grafting involves carefully placing a small amount of new tissue in an area where little or no gum tissue currently exists — typically recommended to prevent further gum recession or to cover root surfaces of your teeth that have become exposed. The tissue used in this procedure may come from a variety of sources but usually is taken from the palate (roof of the mouth), after the area has been numbed for your comfort. Then it is delicately sutured (stitched) in place where it's needed, using suturing material which may be finer than a human hair. Your body's natural recovery process takes over after the grafting procedure is complete. During this time, new blood vessels grow into the graft and help it to become integrated with the surrounding tissue. A successful graft can reduce or eliminate problems like tooth sensitivity and further gum recession, as well as improve the aesthetics of your smile. How do you know if you need a gum graft? Often, you can clearly see or feel the problem. Exposed tooth roots can make your teeth look overly “long,” and they also generally appear somewhat darker than your pearly white crowns. Gum recession is a condition that can increase with age, as we recognize when we hear the phrase “long in the tooth.” But the potential problems of gum recession aren't just cosmetic — they can also seriously impact your oral health. Inside your mouth, gum tissue forms a barrier that resists the vigorous mechanical (and microbial) effects of eating, chewing and biting. Gums may begin to recede, or shrink down, for several reasons. One is ineffective oral hygiene: This includes both inadequate brushing, which fails to remove dental plaque; and excessive brushing, which erodes the tissue. Foreign objects in the mouth that rub against the gums, like poorly fitting removable dentures, tongue bolts, or even fingernails, can also contribute to gum recession. When the tooth's roots lose the protection of healthy gum tissue, they can become extremely sensitive to hot or cold temperatures, causing pain when you consume many foods and drinks. Worse, missing gum tissue makes it easier for bacteria to penetrate the roots and cause decay — or for minor trauma to result in rapid gum recession. In either case, the eventual result may be tooth loss. 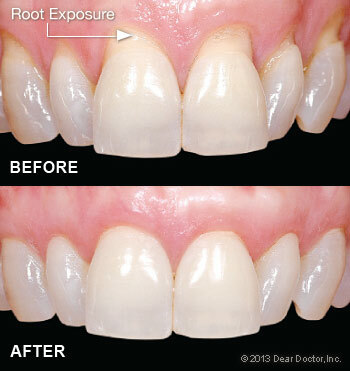 That's why proper treatment of gum recession is so important. After a thorough examination and assessment of your teeth, gums and overall health, the gingival grafting procedure may be recommended. The tissue used in this procedure may be obtained from a variety of sources: an area next to the area of recession, from the hard palate, or donated tissue from another person, which has been medically processed to make it safe to use. There are several different methods of grafting. For example, if you have lost gum tissue in an area of your mouth that's not highly visible when you talk or smile, additional gum tissue can be placed there to prevent further recession without trying to cover the tooth-root surface completely. This procedure is referred to as a free gingival graft (since the tissue is separated from its blood supply), and it takes about 45 minutes to perform. It is very predictable with a very high success rate. If the objective is to cover root surfaces, the procedure becomes more complicated and will take longer, but is still very successful. Grafting procedures are typically carried out under local anesthesia, and are generally pain-free. You should experience very little discomfort after the surgery, even if tissue has been removed from your palate, because that donor area is usually covered by a soothing, liquid band-aid-like material. Fortunately, any discomfort that you do have can be alleviated with over-the-counter or prescription anti-inflammatory medication, and it is generally short-lived. A soft diet (and an antibiotic) may also be recommended for a week or so thereafter, enabling the tissues to heal fully; otherwise, your normal activities will not be limited. Following a gum graft, it's more important than ever to practice good oral hygiene; this will help prevent gum problems from developing in the future. Your regimen should include proper brushing with fluoride toothpaste, daily flossing, a healthy diet and regular dental and periodontal checkups. Maintaining healthy gums is a key to keeping up your overall oral health — and preserving your smile.